Getting Ready for the Tour de France! I am so excited about the start of the 2015 edition of the Tour de France! The field looks like it will provide for some very competitive racing with several past winners of the Tour and even more former winners of other Grand Tours taking to the line for the Prologue in Utrecht. 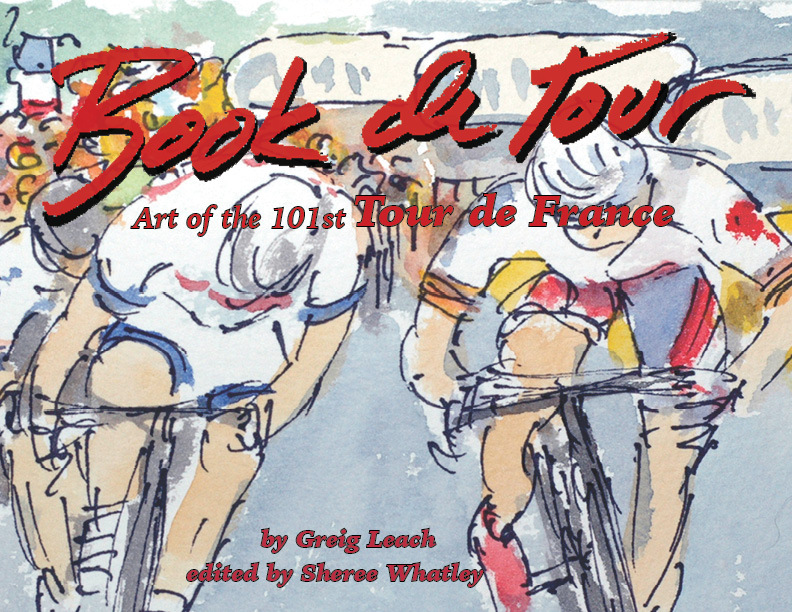 Here is a chance to get a copy of my book about the 101st Tour, with a personal signature from the artist and author of "Book de Tour - Art of the 101st Tour de France. Just follow this link on the listing on ebay at http://www.ebay.com/itm/-/252010360269? Be sure to check back here starting on July 5th to see my paintings and writings on every stage of what should prove to be a very engaging 102nd Tour de France. A Cut and Paste from DeFeet International. I just had to share! I am so very proud of this blog by Shane Cooper of DeFeet Socks. I simply had to cut and paste the blog so you could read it too. Here is the link to watch the video/interview referred to at the end of his blog post. DeFeet Founder and Chief Sockologist Shane Cooper (l) and Greig Leach head out for a ride from the DeFeet factory. I am a connoisseur of art. Especially the art of cycling. There is a lot of art in cycling. Handmade bicycles are probably the most obvious. Product design is an artform. As the Chief Sockologist (self Proclaimed), I feel it is my duty to open my mind and heart to the arts. I could also be called a wannabe artist, but lacking all the talent. I find artists fascinating, whether they are musicians, authors or painters. Whatever their discipline, I am a fan. I try to absorb everything I can from the artists who come into my life. My hope is to be able to understand and utilize this in some way during my short time on Mother Earth. The Greig Leach studio is in Richmond, VA, which is also home to the 2015 World Cycling Championship later this year. Today was one of those days. I was blessed to meet Greig Leach, an Artist born in Washington, DC now residing in Richmond, VA. His talent came to my attention via social media. Twitter to be exact. Check out Greig’s web page here. 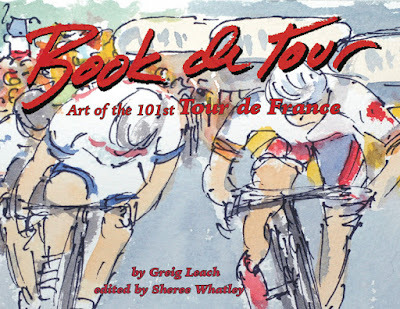 Greig launched a book after last years Tour de France called Book de Tour. Greig Leach holds Book du Tour. The book is a collection of his paintings. Launched with a successful Kickstarter campaign, it was inspired by his love of cycling. Greig and I had a few meetings and voila, he agreed to join DeFeet in a joint venture. Our plan is to show a few of his original works of art on socks and create a joint venture for the 2015 Tour De France. DeFeet has already offered two special Greig Leach socks. We started with Paris Roubaix and then the Giro. He sends us paintings from the races, and we turn them into sock art. Together we built up a little chatter to launch our master plan. The Tour de France is our crescendo, this year. Grieg painted the green, polkadot and yellow jerseys from the Tour. We transcribed these into sock art. Our plan is to offer his Tour de France book with a free sock of choice to go with it. From this simple palate and dreams of cycling come paintings desired everywhere they are seen. Greig paints from his home in Richmond while watching the live feed the races. He paints the race as he feels it. Each move, each attack, he is there as if he is right amongst the peloton. DeFeet socks are a durable and worthy canvas for the art of Greig Leach. We are proud to be able to offer it to our customers. His work is phenomenal and his audience is worldwide. Many of the best athletes in the world call him after a win to ask if he could commemorate their monumental achievement in water color or oil paint. Mr. Leach is star struck, but he obliges these requests whenever possible to create a family memoire that immortalizes the achievement. These paintings are quickly becoming family heirlooms. Paintings like this are inspiring racers, cycling and art enthusiasts all over the world to get their own works of art by Greig Leach. Greig was an amateur cyclist in the mid 70s. Today he rides with the passion of a 10 year old. To see this really effects in a positive way. Greig is immersed in something he loves, and his talent is literally and figuratively stopping the world. We did a quick spin today, chatting and enjoying our conjoined passions. Wow. Another incredible day spent with an amazingly talented person and a true soul cyclist. The 2015 World Cycling Championship are in Richmond VA in September. Mr. Leach is the “official artist” for this quest for the Rainbow Jersey (and Rainbow Socks if the athlete is lucky enough to be on a DeFeet team). What a huge honor! Go watch the race, go watch Grieg paint his way into history. Greig’s art is created using Yarka St. Petersburg watercolors and Steve Quiller brushes from the small family run art supply company called Jack Richeson and Company. Their website is www.richesonart.com. Take 2 mins to watch the interview, let Greig tell you in his own words. This is another time when I get to geek out about how my cycling art is reaching out to the pro peloton and the world wide cycling community. 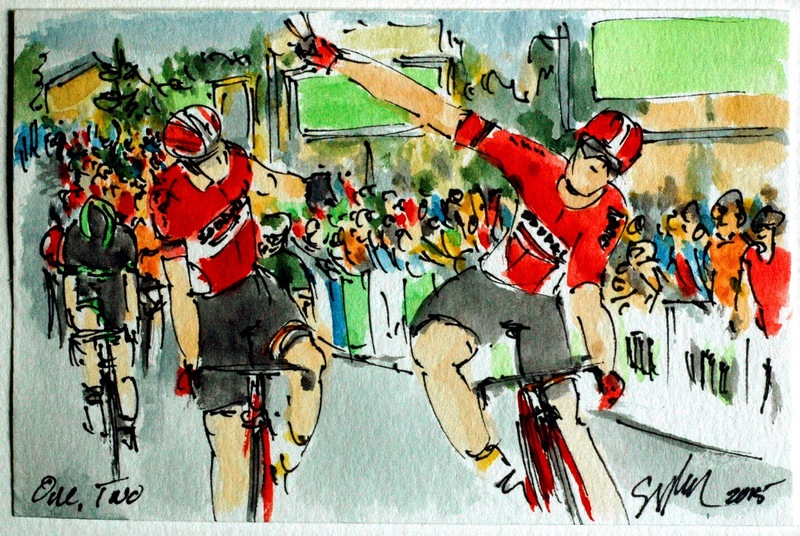 This painting was done as a commission for the Belgium rider, Kris Boeckmans (Lotto Soudal), winning a stage of the Tour de Picardie. Kris has reached out to me on twitter (www.twitter.com/artofcycling). This is the second image that he has a commissioned of him winning a race. I am truly honored that these hard men in spandex actually enjoy and treasure my paintings. I so enjoy what they are capable of doing. I love to ride and long ago tried my hand at amateur racing. I wasn't bad, but I know that I am a much better at making art than I ever was a competitive cycling. I think I will stick to club rides and painting that fast men doing what I could only dream of doing. If you would like to commission a work for yourself. Email me at greigsart@gmail.com and we can discuss the image, the size and the cost. International shipping is available.